alright I'm tired of scrolling through pages with small commercials, here and there. SO with that if YOU make holsters post a generic ad here. 612-282-3453 6:30 am to 6:30 pm works best. I have poor reception on my cell at home, but feel free to leave a message in the evening if I do not answer. I specialize in higher quality hand crafted gun leather, custom fit and formed. I enjoy the exotic trimmed leather. It gives me a wider spectrum of artistic freedom. I have to give thanks to my lovely and talented bride for her full support of my endeavor, as well as my family. As a part time gig for me, it would not be possible without their support and encouragement. I give credit to Ryan Grizzle at rgrizzleleather for inspiring me. I owe all of my success to the fine members and mods of SIGforum. Without you, none of this would have happened. My future aspirations are to learn more about tooling leather. Phone number: I do all business communications via e-mail, responding to over 100 messages every week. If I advertise my phone number, and receive half that many calls, I won't have any time left for work. My customers might prefer that I complete their orders instead of talking on the phone all the time. Vietnam veteran, retired cop. I started making holsters in 1972 to meet my own needs, then making holsters and accessories for other officers. I am now completing and delivering 25 to 40 items every week for customers in all 50 states and 9 foreign countries to date. I use only premium quality Hermann Oak leather. 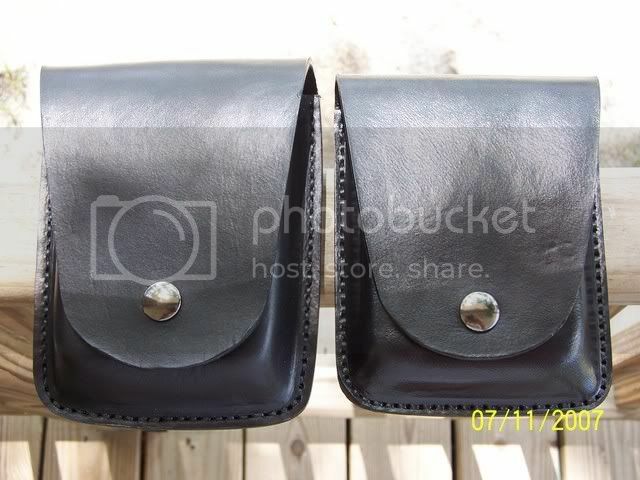 Every holster is hand-formed and finished by me, or under my direct supervision by my apprentice. I offer 8 standard designs in 4 finish colors, with 4 available options, for over 90 handgun models (over 10,000 possible variations). My designs range from traditional classic models to new innovations not available from any other source. Every item carries a one-year warranty against defects in materials or workmanship. Even though delivery costs continue to rise, I still include free delivery to any US address on all orders. I hate the inflated "shipping & handling fees" charged by so many companies! Glad to hear from you anytime. As does Ray @ Lobo. Great value for the price. Although, I am in the leather business, my self, there is alot of fine makers addressing this thread. Their work is outstanding. Keep it coming. I'm sure I will learn something just from the pic's. What a great forum to share products and methods. Come on Al, the title says holster and BELTS! You can do better than that to make people aware of your top quality belts and lightning fast shipping. all of my contact info is on my web page. Talked to David today. First class stand up guy with great products. Give him a try! This might be a good spot for this. I'm an LEO and I've had an idea for a BUG holster. 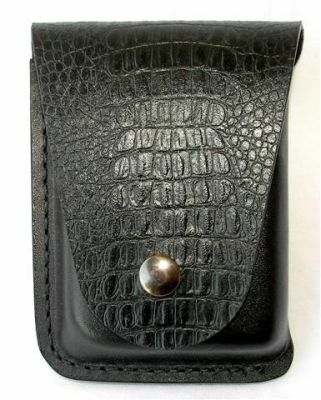 Anyone of ya'll interested in making a holster for a "pocket pistol" that looks like a handcuff case? 706-265-0118 calls accepted Tue. - Sat. 10am to 5pm EST. I offer a variety of quality handmade concealment holsters and accessories. My products are made per order from premium Hermann Oak leather. I also work with horsehide, some exotics and do some custom work as well. Feel free to check out my website for photos and more information. If you have any questions please don't hesitate call or email. The Lord has been good to me and my family and has really blessed us. This is a family run business and we enjoy what we do for a living. I would like to thank Para and the mods for allowing us to use the classified section of the forum. It has helped put food on my table. I also appreciate the members who have ordered from me and helped spread the word about my products. I would like to thank Mark Garrity as well who has answered several questions for me in the past and has been a great help. I'm not sure I was much of an inspiration but I appreciate the mention. A few samples of my work. Field gear made by me, carving and tooling done by my wife. I offer a variety of handmade concealment holsters and accessories. All of my products are made from premium Hermann Oak leather, ordered directly from the tannery. My products are made per order one at a time. I do work with some exotics and do some custom work. This is a family business and making holsters is my full time job. My wife handles the orders and office work. She and the kids help out where they can making holsters. Questions are handled through email. Emails are answered daily and usually within a couple of hours. I do not have my phone number posted but if you would rather speak to me or order by phone, send me an email and I will send you my phone number. I would like to say that The Lord has been good to me and my family and has really blessed us. I would like to thank the mods for allowing us to use the classified section. It has helped put food on my table. I also appreciate the members who have ordered from me and helped spread the word about my products. I also want to thank Mark Garrity who has answered several questions for me in the past and has been a great help. Your holsters are an inspiration. Mossberg 500 Mariner 12 ga.
Good stuff. Some quality leather workers in this thread. If anyone hasn't yet, i suggest giving one of these guys an email/call and get something made. All of the products i've purchased from them have been top notch. I have two holsters and a belt from Ironguy. Scott makes great gunleather and belts. I can't recommend his services highly enough.